This work was carried out in the frame of the project "Coolant mixing in pressurized water reactors" (registration number: 1501216) funded from 01.04.1998 to 31.05.2002 by the German Federal Ministry of Economics and Labour. In hypothetical accident scenarios connected with asymmetric perturbations in the primary circuit of a nuclear power plant like overcooling of one loop due to a steam line break or local boron dilution events, 3D effects have to be considered. Usually, the computational analysis of such scenarios is performed within three off-line coupled steps, each of them carried out independently. First of all, a thermal hydraulic analysis of the transient is carried out by means of an advanced thermal hydraulic system code. From that calculation, boundary conditions are derived for an analysis of the 3D mixing processes inside the reactor pressure vessel using a computational fluid dynamics (CFD) code. The results of this calculation (temperature or boron concentration distribution at the core inlet) are used in a 3D neutron kinetics analysis of the reactor core behaviour. Recently, 3D neutron kinetics core models have been coupled with advanced thermal hydraulic system codes. To be able to turn from the above described three step off-line approach to a fully coupled analysis of the whole process, the implementation of a model is necessary, which links the thermal hydraulics of the system code with the thermal hydraulics of the core model, simulating the mixing processes in the pressure vessel in a realistic way. Due to the long computation times the direct integration of CFD-modules into reactor safety analytical tools is not practical at present. There exists a need for a fast running model for the description of the coolant mixing inside the vessel. In regard to the transport of an under-borated slug from the inlet nozzles through the downcomer and the lower plenum, up to the core inlet, the reactor pressure vessel represents a transfer system with multiple inputs and outputs. This system becomes time dependent if the coolant velocity field depends on time. The input signals are functions of the coolant enthalpy and boron concentration at each of the inlet nozzles. In general, these functions can be independent from each other at the different inlet nozzles. The output signals are the same quantities at each fuel element position in the core support plate. The boric acid concentration can be treated as a scalar, which is transported by the velocity field of the fluid. This scalar does not feed back to the velocity field. Therefore, the transport of such a scalar in a given velocity field is a linear process. That means that, for constant geometrical boundary conditions (pressure vessel geometry) and a well-known velocity distribution in the system, different scalar fields can be superimposed linearly. Such a treatment is valid for stationary as well as for transient processes. This offers the possibility of developing a simplified mixing model for boron transport. In this model, the multiple input-output system of the RPV is described formally by a number of transfer systems, one system for each combination of inlet nozzle and fuel element position. These systems have different transfer properties, but there is no interaction between the different systems. The disturbance of such a system by a Dirac pulse is an appropriate method to explore these unknown transfer properties. A disturbance of the system by a function of any form (for instance: a slug of coolant with lower boron concentration) can be represented by a sequence of such Dirac pulses. 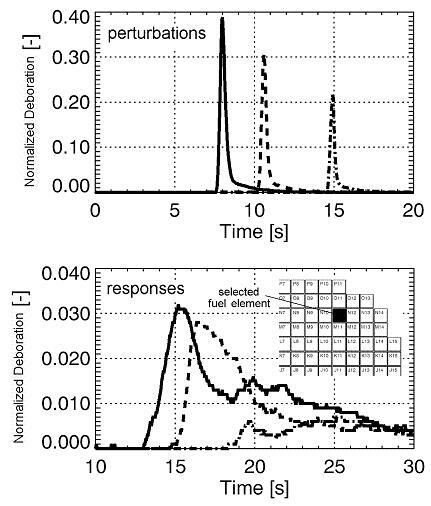 The system response at each fuel element position is obtained by superimposing the responses to the different Dirac pulses with the same coefficients like at the input. The transfer properties can be determined experimentally or by CFD. Here, the experimental approach is presented. It is demonstrated on the start-up of the first main coolant pump. In this particular case, the number of inputs to the systems reduces to one. For that purpose, experiments at the ROCOM test facility were carried out. Particularly, the measurements of two of the wire-mesh sensors at this facility are used for the determination of the transfer functions. The sensor located in the reactor inlet nozzle of one loop measures the input signal to the above introduced systems. The other sensor measures the concentration at each fuel element inlet position at the lower core support plate. To get the pulse responses, experiments were performed injecting the tracer solution over a short time (nearly 0.1 s) into the loop with the starting pump. It has to be taken into account, that due to the considered pump start-up process the transfer behaviour changes in time. Therefore, the time position of the injection in the pump start-up ramp has been varied in the different experiments. The pulses of three experimental series are shown in the upper part of Fig. 1, the responses to these pulses measured at a certain fuel element position in the lower one. As can be seen from Fig. 1, the transfer behaviour of the above introduced systems were exposed to an input signal, nearly being a Dirac pulse. The time course F(t) of the slug concentration to be modelled at the reactor inlet can be reconstructed from n pulse functions gj(t) as shown on the scheme, where gj(t) is the time course of the jth pulse, aj is a coefficient, weighting the contribution of the jth pulse to the requested slug. The number n depends on the volume of the slug to be modelled. The coefficients aj are obtained as solution of a least squares deviation problem between input and approximated slug. The transient course of the boron concentration at each fuel element position can be derived in a similar manner using the same coefficients aj. The time course of the mixing scalar Hk(t) for each k of the 193 fuel element positions can be calculated by the shown formulae, where hkj(t) is the time course of the jth answer function at the corresponding fuel element position k.
The described technique of superposition is the main part of a calculation program with the name SAPR (semi-analytical perturbation reconstruction). Fig. 2 shows the time history of the average and the maximum value of the normalized perturbation at the core inlet in pump start-up experiment. The confidence-intervals of one (68.3 %) and two standard deviations (95.4 %), calculated on the basis of a certain number of single realisations of the experiment, are shown, too. The experiment was calculated by means of the CFD-code CFX-4, too. So, the comparison between experiment, semi-analytical model and CFX-calculation is presented here. The time course of the average of the normalized deboration calculated by the SAPR-model shows practically the same behaviour like the experimental one. The maximum of the average is reached at the same time. In the later part of the transient, the calculated concentration is slightly higher than the measured one, but always inside the confidence-interval. In the CFX-calculation, the concentration increases more slowly and the maximum is reached later. In the further course, the CFX-values are also inside the confidence-interval (lower boundary). In both calculations, the maximum concentration at the core inlet is very close to the experimental data. After reaching the maximum in time, the value calculated by the SAPR-model belongs mostly to the upper part of the confidence-interval, the CFX-value to the lower edge. The agreement on local positions can be assessed, starting the animation shown on Fig. 3. Here, the time-dependent core inlet distribution in the experiment (left), the SAPR-calculation (middle) and the CFX-calculation (right) are shown. The time-dependent distributions obtained by means of the SAPR-model show a very good agreement with the experimental ones in time course and shape of the deboration front at the core inlet. The CFX-calculation shows qualitatively the same behaviour, all main effects are to be seen, too. but the shape of the distribution calculated by CFX deviates to some extent.